Comments: With its vast space fleet, the Imperial Navy is a model of military efficiency. The best pilots in its ranks are rigorously trained to useto use highly maneuverable and heavily armed Twin Ion Engine (TIE) fighters. 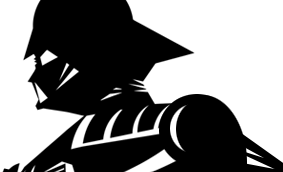 The small ships are used to both attack - and defend against - Rebel forces. Unlike the stormtroopers, TIE pilots wear black plastisteel protective armor over an insulated high-gravity body glove. Their reinforced helemt features polarized lenses, a navigational computerlink-up screen, a vocoder, and breathing filters. Two gas transfer hoses connect from the helmet to a chestplate control unit which contains an emergency atmospheric unit and control switches for the armor functions. Tightly sealed wrist gauntlets allow dexterity in handling TIE Fighter controls, while positive-gravity pressure boots keepthe pilot well anchored even in zero-gravity situations. 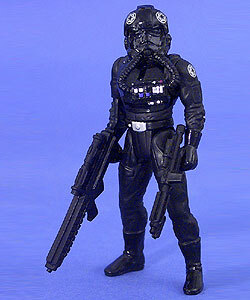 Point of Interest: Parts of the sculpt of the TIE Fighter Pilot was used for the Cruisemissile Trooper pilot figure.